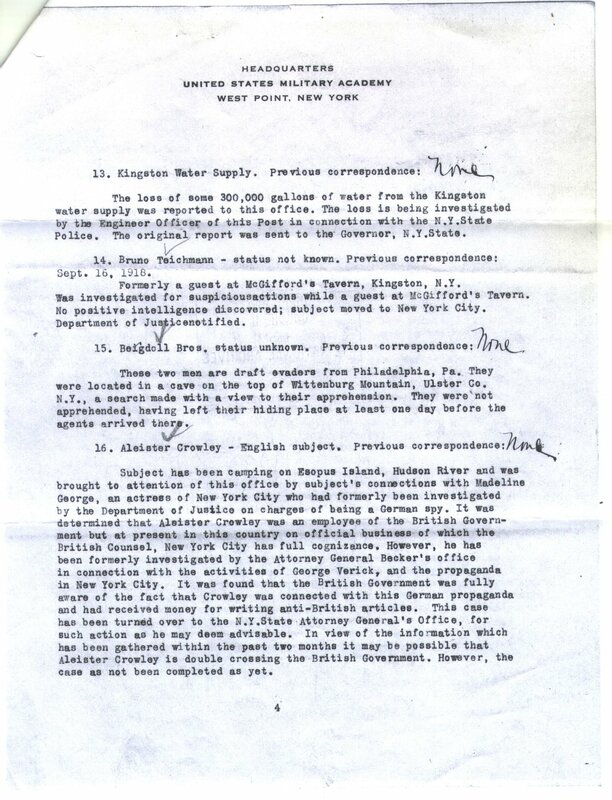 ... memo sent by special agent Manning C. Clements in 1964 concerning a speech given by Oren Fenton Potito. Potito appears to have been a church minister and key member of the National States Rights Party (NSRP), a white supremacist party. According to the memo, Potito said in his speech that â€œthe â€˜Surgeon Generalâ€™s reportâ€™ on the assassination stated the first bullet entered the Presidentâ€™s throat below the adams apple clearly showing that two persons were involved with the first shot being first from the bridge across the park was in front of the car. Book V The performance of the intel agencies in the investigation of JFK assaination of the Senate Select Committee to study govt operations, the CIA is criticized for its apparent faikure to fully pursue leads surrounding the assassination of JFK and then to fully report to the Warren Commission the results of the investigation they did undertake. CIA Atrocities - When will rogues in the CIA be held accountable for their many crimes against humanity since their inception? Merle Miller: Mr. President, I know that you were responsible as President for setting up the CIA. How do you feel about it now? Truman: I think it was a mistake. And if I'd know what was going to happen, I never would have done it. Jfk doc #489 Criticizes Warren Commission for not broadening its review to include anti-cuban programs of the US Govt. The SSC Final report accuses intelligence agencies of dereliction and worse. 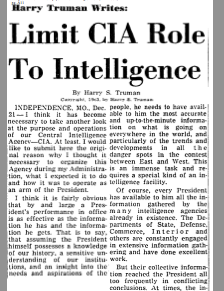 Jfk Doc #491 E Howard Hunt was a contract employee of the agency, CIA. Cover was a writer and a retired foreign service officer. Richard Helms appears to have contracted him and an acct opened at Chase Manhatten. He is said to have only talked with top agency persons, so compartmentalized. He wrote spy novels under pseudonym David St John (he also named his son St John, btw). More details about Hunt who was a big player in the assassination of JFK, by his own admission in his deathbed confession, posted previously in this topic. Last page gives timeline of Hunts assignments. Most detail I have read on Hunt thus far. Interesting! notice the media black hole all this went into .. This is why the public thinks the MSM is a joke. The public knows the MSM lies by commission and omission. MSM IS PUTTING THEMSELVES OUT OF BUSINESS. SO STUPID! Pg 19 Frank Sturgis aka Frank Fiorini hired by cia at least a decade and in touch with all Havana casino operators. He recruited Marie Lorenz and gave her poison powder pills to slip into Castros food / drink. Interesting info in this 103 page document. In the third public release this year, the National Archives today posted 676 records subject to the President John F. Kennedy Assassination Records Collection Act of 1992 (JFK Act). The majority of the public release today consists of 553 Central Intelligence Agency (CIA) records that were previously denied in their entirety. Also included in the release are records from components of the Departments of Justice (18) and Defense (48), the House Select Committee on Assassinations (56), and the National Archives (1). Released records are available for download. The National Archives released 2,891 documents on Oct. 26 and 3,810 records on July 24. The National Archives established the John F. Kennedy Assassination Records Collection in November 1992, and it consists of approximately five million pages of records. The vast majority of the collection has been publicly available without any restrictions since the late 1990s. You can access individual files by browsing the webpage above and selecting the link in the "Doc Date" column. You may also download the Excel spreadsheet above, which includes links to all of the files. If you need copies of all PDF and WAV files, you can request a compressed bulk download by emailing [email protected] with â€œJFK Bulk Downloadâ€� in the subject line. Rafael Cruz (father of Ted Cruz) was with Oswald verified by Judyth Vary Baker who knew Oswald. She says Cruz and Oswald were good men. She also says Oswald was a patsy and did not kill JFK. They were involved in an FBI sting, in a setup, passing out flyers for a concocted group, Fair Play for Cuba Committee, of which only Oswald was a member. They were trying to catch spies. Ted Cruz is also a spitting image of the guy in pic. 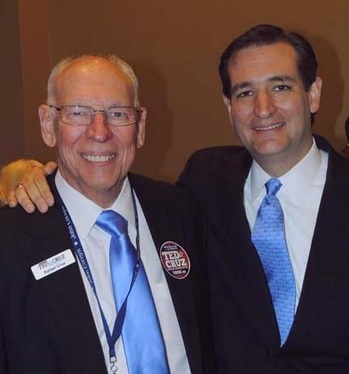 Rafael Cruz is identified as man in pic. so we have to sort thru the redacted- unredaCTED - GEEZ .. In the fourth public release this year, the National Archives today posted 13,213 records subject to the President John F. Kennedy Assassination Records Collection Act of 1992 (JFK Act). The majority of the documents released today were released previously in redacted form. The versions released today were prepared by agencies prior to October 26, 2017, and were posted to make the latest versions of the documents available as expeditiously as possible. Released records are available for download. On October 26, 2017, President Donald J. Trump directed agencies to re-review each and every one of their redactions over the next 180 days. As part of that review process, agency heads were directed to be extremely circumspect in recommending any further postponement of information in the records. Agency heads must report to the Archivist of the United States by March 12, 2018, any specific information within particular records that meets the standard for continued postponement under section 5(g)(2)(D) of the JFK Act. The Archivist must then recommend to the President by March 26, 2018, whether this information warrants continued withholding after April 26, 2018. The records included in this public release have not yet been re-reviewed by the agencies as part of that process and have not been reviewed by the National Archives. The National Archives released 676 documents on Nov. 3, 2,891 documents on Oct. 26, and 3,810 records on July 24.
Who Killed President Kennedy And Why? And then within the next two years, an astonishing number of people (more than 50!) who possessed some kind of information about the Kennedy assassination died under mysterious circumstances. The Navy officer Lt. William Pitzer, who managed the closed-circuit camera in the autopsy room at the at Bethesda Naval Hospital and filmed the proceeding, was later discovered to have â€œshot himselfâ€� , and the tape of the film had vanished. A week later, the taxi driver who drove Oswald home from the book depository on the day of the presidentʼs assassination, William Whaley, was killed in a car crash. The same fate befell one of the witnesses to the Kennedy assassination, Lee Bowers, who saw â€œtwo men shooting from behind the fence. â€� Three of the five people who were present in Jack Rubyʼs house on the evening of Nov. 24, 1963 were shot to death (the lawyer Tom Howard and reporters Bill Hunter and Jim Koethe) â€¦ And on Nov. 8, 1965, Dorothy Kilgallen, who was the only journalist granted a private interview with Jack Ruby after Oswaldʼs assassination, died of a â€œdrug overdose, â€� although she had never taken drugs. There are dozens of such examples, and the names involved have never been a secret, but is it even worth pointing out once again that these people are never mentioned in the declassified files from the US National Archives? But the document ends there, and Mr. Helmsâ€™s answer is missing. However, Judyth Vary Baker said Oswald did have intelligence agency ties. She says Lee was a deep cover intelligence agent. She was his girlfriend. She is adamant, even today, that Oswald was innocent. she claims was a CIA/Mafia conspiracy with Lee Harvey Oswald being a designated scapegoat. Frank Wisner was appointed head of the DPP and he appointed Helms as his chief of operations. In December, 1956, Wisner suffered a mental breakdown and was diagnosed as suffering from manic depression. During his absence Wisner's job was covered by Helms. The CIA sent Wisner to the Sheppard-Pratt Institute, a psychiatric hospital near Baltimore. He was prescribed psychoanalysis and shock therapy (electroconvulsive treatment). It was not successful and still suffering from depression, he was released from hospital in 1958. Wisner was too ill to return to his post as head of the DDP. Allen W. Dulles therefore sent him to London to be CIA chief of station in England. 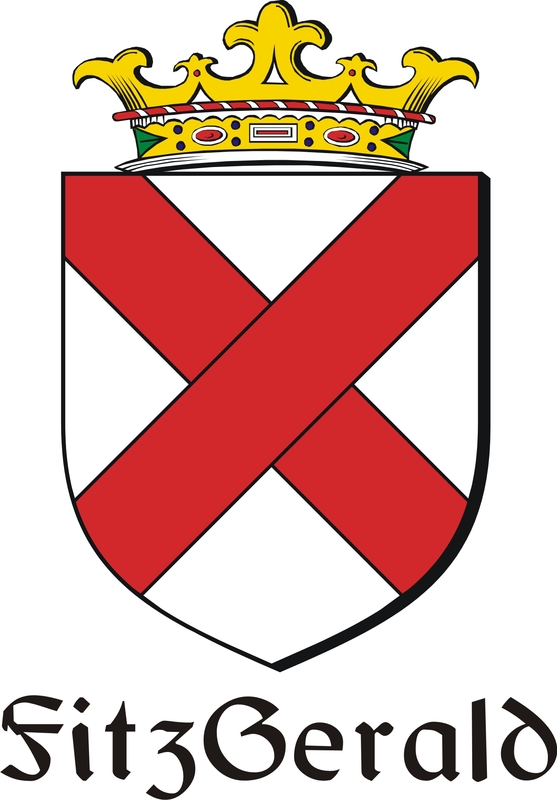 Dulles decided that Richard Bissell rather than Helms should become the new head of the DPP. Helms was named as his deputy. Together they became responsible for what became known as the CIA's Black Operations. This involved a policy that was later to become known as Executive Action (a plan to remove unfriendly foreign leaders from power). This including a coup d'Ã©tat that overthrew the Guatemalan government of Jacobo Arbenz in 1954 after he introduced land reforms and nationalized the United Fruit Company. Other political leaders deposed by Executive Action included Patrice Lumumba of the Congo, the Dominican Republic dictator Rafael Trujillo, General Abd al-Karim Kassem of Iraq and Ngo Dinh Diem, the leader of South Vietnam. However, his main target was Fidel Castro who had established a socialist government in Cuba. In March I960, President Dwight Eisenhower of the United States approved a CIA plan to overthrow Castro. The plan involved a budget of $13 million to train "a paramilitary force outside Cuba for guerrilla action." The strategy was organised by Bissell and Helms. An estimated 400 CIA officers were employed full-time to carry out what became known as Operation Mongoose. When John F. Kennedy was assassinated in Dallas, Helms was given the responsibility of investigating Lee Harvey Oswald and the CIA. Helms initially appointed John M. Whitten to undertake the agency's in-house investigation. 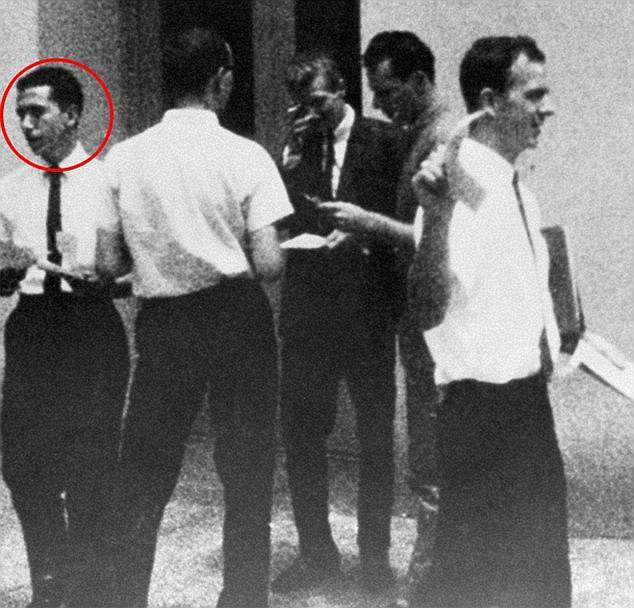 After talking to Winston Scott, the CIA station chief in Mexico City, Whitten discovered that Oswald had been photographed at the Cuban consulate in early October, 1963. Nor had Scott told Whitten, his boss, that Oswald had also visited the Soviet Embassy in Mexico. In fact, Whitten had not been informed of the existence of Oswald, even though there was a 201 pre-assassination file on him that had been maintained by the Counterintelligence/Special Investigative Group. Whitten now realized that the FBI had been withholding important information on Oswald from him. He also discovered that Richard Helms had not been providing him all of the agency's available files on Oswald. This included Oswald's political activities in the months preceding the assassination. Helms responded by taking Whitten off the case. James Jesus Angleton, chief of the CIA's Counterintelligence Branch, was now put in charge of the investigation. According to Gerald McKnight (Breach of Trust) Angleton "wrested the CIA's in-house investigation away from John Whitten because he either was convinced or pretended to believe that the purpose of Oswald's trip to Mexico City had been to meet with his KGB handlers to finalize plans to assassinate Kennedy." Investigations by the CIA's Inspector General and by Frank Church and his Select Committee on Intelligence Activities showed that Helms had lied to the Senate Foreign Relations Committee. They also discovered that Helms had been involved in illegal domestic surveillance and the murders of Patrice Lumumba, General Abd al-Karim Kassem and Ngo Dinh Diem. Helms was eventually found guilty of lying to Congress and received a suspended two-year prison sentence. Percival - Grail found . The Lancelot-Grail, also known as the Prose Lancelot, the Vulgate Cycle, or the Pseudo-Map Cycle, is a major source of Arthurian legend written in French. It is a series of five prose volumes that tell the story of the quest for the Holy Grail and the romance of Lancelot and Guinevere.The major parts are early 13th century, but scholarship has few definitive answers as to the authorship. An attribution to Walter Map is discounted, since he died too early to be the author. 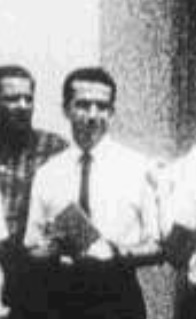 After returning from the Soviet Union, Lee Harvey Oswald became close friends with Dallas resident and petroleum geologist George de Mohrenschildt. De Mohrenschildt would later write an extensive memoir in which he discussed his friendship with Oswald. De Mohrenschildt's wife would later give the House Select Committee on Assassinations a photograph that showed Lee Harvey Oswald, standing in his Dallas backyard, holding two Marxist newspapers and a Carcano rifle, with a pistol on his hip. Thirteen years after the assassination, in September 1976, the CIA requested that the FBI locate De Mohrenschildt, in response to a letter De Mohrenschildt had written directly to his friend, CIA Director George H.W. Bush, appealing to Bush to stop the agency from taking action against him. Several television programs, including Jesse Ventura's "Conspiracy Theories", have alleged that De Mohrenschildt was Oswald's CIA handler but have offered little evidence. On March 29, 1977, De Mohrenschildt stated during an interview with author Edward Jay Epstein that he had been ordered by CIA operative J. Walton Moore to meet Oswald. He also told Epstein that he would not have met Oswald had he not been ordered to do so. (In fact, de Mohrenschildt had met Oswald several times, from the summer of 1962 to April 1963.) That same day, De Mohrenschildt was informed by his daughter that a representative of the House Select Committee on Assassinations had stopped by, leaving a card and intending to return that evening; he then committed suicide by shooting himself in the head shortly thereafter. De Mohrenschildt's wife later told sheriff's office investigators that her husband had been hospitalized for depression and a fear of persecution in late 1976 and had tried to kill himself four times that year. My take on the jfk assassination , anyone who knows anything about firearms knows JFK had his brains blown out the back of his head so that rules out Lee Harvey Oswald firing the death shot . the truth is never going to get told . July 14, 2017 was this Jimâ€™s last presentation? JFK researcher John Armstrong has shown that the Warren Commission combined the biographies of two different people to arrive at the classic legend of Lee Harvey Oswald. One was a Russian speaking youth, possibly the child of Hungarian parents. Mr. Armstrong notes that this person preferred to be called "Harvey." The other was a taller but similar looking boy with a Southern U.S. accent, born as "Lee Harvey Oswald," and who preferred to be called "Lee." Both youths became entangled at an early age in an American intelligence operation designed to give a U.S. identity to a Russian-speaking child. It was "Harvey" who traveled to Russia and was shot dead by Jack Ruby. It was "Lee" who framed "Harvey" for the assassination of JFK. The operation began when both "Harvey" and "Lee" were CHILDREN, but it probably did not become entangled in the plot to assassinate President Kennedy until the spring and summer of 1963. Basically what I have here are various links and info that show the connections of Aleister Crowley - Rudolph Hess - Hitler and the Tavistock group. The occultist magician Aleister Crowley liked to describe himself as the Antichrist of the Apocalypse (Therion - Beast 666) and once boasted: "Before Hitler was, I am." He often claimed that Adolf Hitler was his guinea pig or magic child, < http://www.magicchild.com/html/hypnosisfaq.html > a term used by hypnotists to describe an "inner shadow" or product of the unguarded psyche. Police and military intelligence files are even better sources for collecting mug shots than a newspaper survey. According to Crowley, Professor Hugo Munsterberg of Harvard University was the war-time secret director of German propaganda in America. Crowley went to great lengths to act as a friend to Munsterberg and even volunteered to collect and report information for Germany and the Central Powers of World War I. Hundreds or perhaps thousands of photographs of German soldiers could have been classified and studied to find Crowley's look-alike. But why Aleister Crowley? According to some accounts, Crowley was not only an occultist, but also a double-agent during the First World War; a skilled practitioner of counter-espionage. He wrote disturbing anti-British stories for a pro-German weekly paper called The Fatherland, published in America by George Sylvester Viereck. And the New York Times even printed a three-column article about how he supposedly destroyed his British passport, while standing in a small motorboat with a woman playing a violin, under the Statue of Liberty. Crowley had told Viereck in 1915 that he wanted to help Germany in order "to exploit the stupidity of the British public." But he later claimed to others that he was actually doing mischief to Germany by working upon "the baser passions of the mob" and wrecking the German propaganda machine. Way back in 2000, University of Idaho Professor of History, Richard B. Spence, wrote an essay for the International Journal of Intelligence and Counter lntelligence. It was Richard, who in his essay titled: Secret Agent 666: Aleister Crowley and British Intelligence in America, 1914-1918 â€“ first revealed that there existed actual documents concerning Crowley working for the British government as a spy. Richard has also since published a book with the same title (available at Amazon) or you can read some of it through Google books. Today, we bring you one of those documents, a key one, that Mike recently obtained from the National Archives. As far as we can tell, this is the first time that this almost 100-year-old document has ever been actually made available for people to see on the internet. If you want to read through the who killed jfk go through this lot . I watched the Oliver Stone movie â€œJFKâ€� with Kevin Costner today. Everyone should try to find a copy and watch this movie. Its excellent! Then research the things it references. The Warren Commission was not credible. They failed the American people just like the 911 Commission. The lies have to stop! Only an informed public can stop the lies! Also listen to Stones testimony to the Congress (below) where he talks about where he got material for his movie. I believe Stone was trying to awaken Americans with this movie. Very credible, IMO! TIME 1:17:54 Stones states his two theories of what happened to JFK. Very interesting! Time 1:21:00 "We had a president moving on many fronts to rock the boat, the establishment"
In 1991, Stone showed JFK to Congress on Capitol Hill, which helped lead to passage of the Assassination Materials Disclosure Act of 1992. The Assassination Records Review Board (created by Congress to end the secrecy surrounding Kennedy's assassination) discussed the film, including Stone's observation at the end of the film, about the dangers inherent in government secrecy. Scobey was a lawyer employed by the Warren Commission. This article is referenced in Mark Laneâ€™s book â€œRush to Judgmentâ€� pg 15. Below are the first 10 volumes of 26 of the Warren Commission Hearings. In these hearings you will find testimony that never made it into the final report because the Commission started with the premise that Oswald was the lone gunman. This they dismissed any testimony that did not fit that premise. See Contents page for list of names of those who testified in each Volume.